PUBLIC SERVICE BROADCASTING REMIX OF ‘FRIENDS MAKE THE WORST ENEMIES’ PREMIERED. 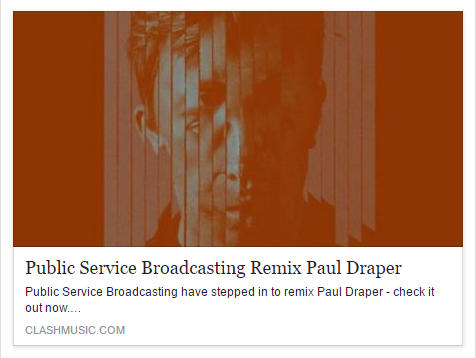 Clash magazine have premiered the PUBLIC SERVICE BROADCASTING remix of Paul Draper’s ‘Friends Make The Worst Enemies’, describing it as a ‘True meeting of minds‘. You can find the article, which contains a link to the remix HERE .